rotherham business news: News: Chancellor heralds "manufacturing cradle of the future"
News: Chancellor heralds "manufacturing cradle of the future"
Chancellor George Osborne praised the University of Sheffield's Advanced Manufacturing Research Centre (AMRC) for its cutting edge approach to quality, industry-powered higher apprenticeships during a visit to Rotherham. The AMRC focuses on advanced machining and materials research for aerospace and other high-value manufacturing sectors. It is a partnership between industry and academia, which has become a model for research centres worldwide. The Chancellor was on the Advanced Manufacturing Park (AMP) in Rotherham to sign a devolution deal for the Sheffield City Region and toured the state-of-the-art Factory of the Future and met apprentices at the AMRC Training Centre, where he learnt the importance of advanced apprenticeships achieving the same excellent reputation as Britain's traditional university degrees. He told guests that the AMRC symbolised the economic future of the region. 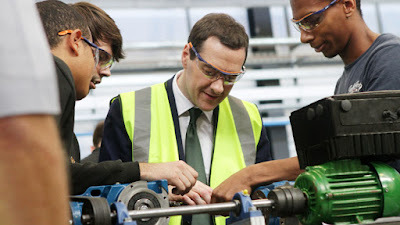 The Sheffield city region was "the manufacturing cradle of the world," said Mr Osborne, adding: "What we are seeing here is the manufacturing cradle of the future." Earlier this year, the AMRC announced a new education route for successful apprentices to study advanced vocational university degrees as part of their apprenticeship training. This means the University is one of the first in higher education to offer quality advanced manufacturing Foundation, Undergraduate and Masters degrees using the apprenticeship model, jointly funded with business. The AMRC Training Centre takes 250 advanced apprentices a year and is currently providing training for more than 350 first and second year apprentices and hopes to significantly increase that number with further Government backing. Sir Keith Burnett, vice-chancellor at the University of Sheffield, said: "As the regional economy grows, we will see the growth of our AMRC Training Centre - an inspirational model for the very best apprentice education totally attuned to innovation and the needs of industry. "I am thrilled that the Chancellor has seen for himself these superb apprentices who work in such a progressive environment can continue to be trained to degree level and shape the future of UK industry. There is a pioneering spirit at work. With these new powers for the city, I am certain we will lead the UK in providing technical education of the very highest quality. "The advanced apprenticeship model developed here provides real access to opportunity so attractive to advanced manufacturing firms who know there are sustainable jobs here and careers that will pay. It's precisely what the nation needs, not only to conquer challenges in the UK economy such as labour productivity and skills, but also to compete and connect globally. I am glad of the chance to show what the North has to offer."